Those Black Krims look interesting. I will be following. I have to see if I have everything needed for my EB. If I do I will have to have Mark set it up for me as I wont be able to do it. I think I need to get the stuff to put in the dirt however. I usually order the replant kits from Amazon because they get here so quickly on Prime, but I needed potting mix too so ordered it all to be delivered from EB itself. 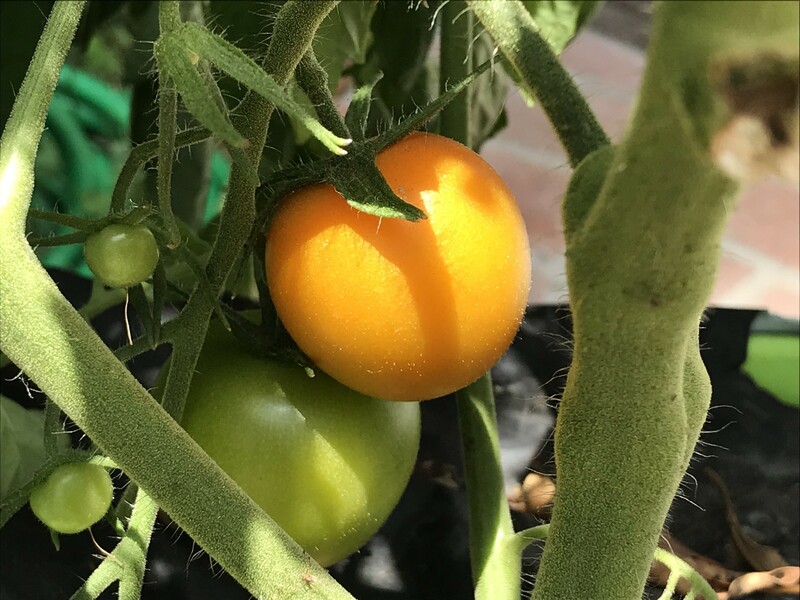 I just realized that that I should not have planted these 2 tomatos together - one is a cherry and one is a regular size fruit. Oh well, hopefully it won’t matter, as long as the size of the plants are compatible (I have no idea if they are). HA! Mine are out there buried under the snow while the new bale of Pro BX sits iin my front hallway! 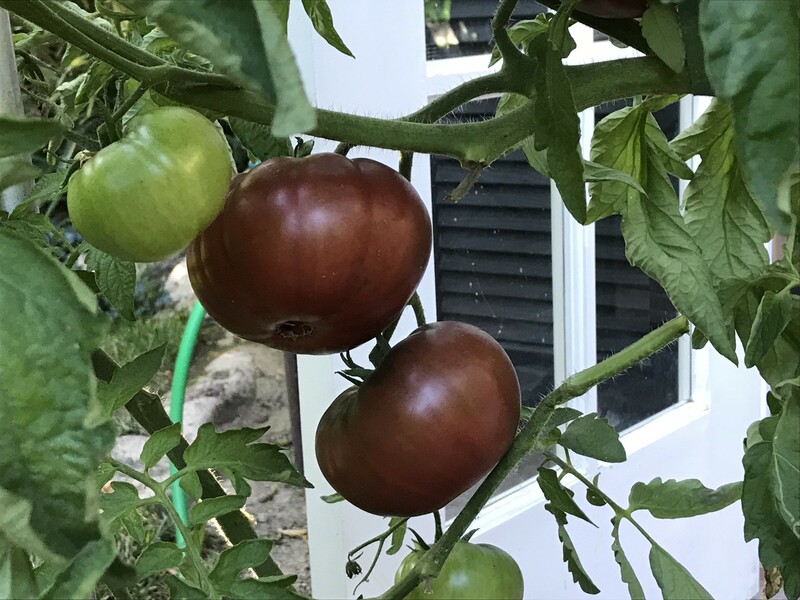 I always wanted to know how to tell when purple toms got ripe! This looks like a very interesting project and the inside of the fruit looks so tantalizing! 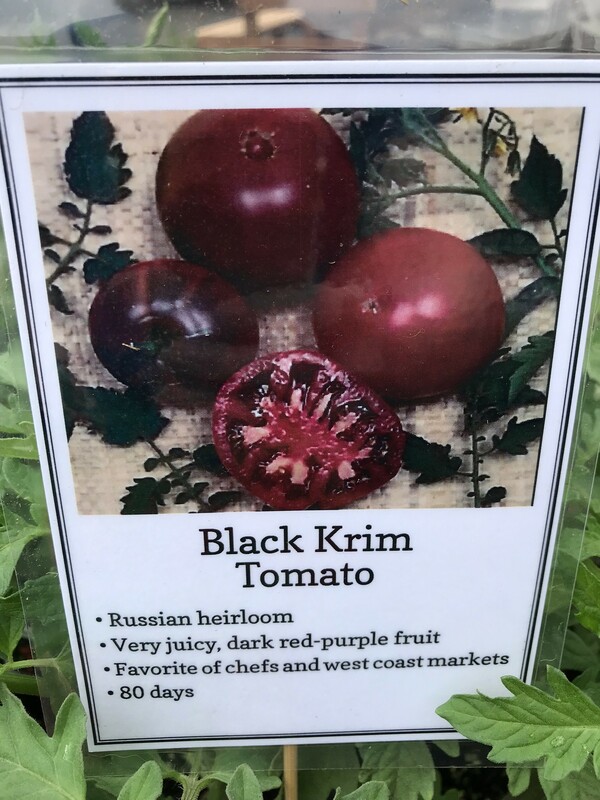 I’m very curious about the taste of the Krim. 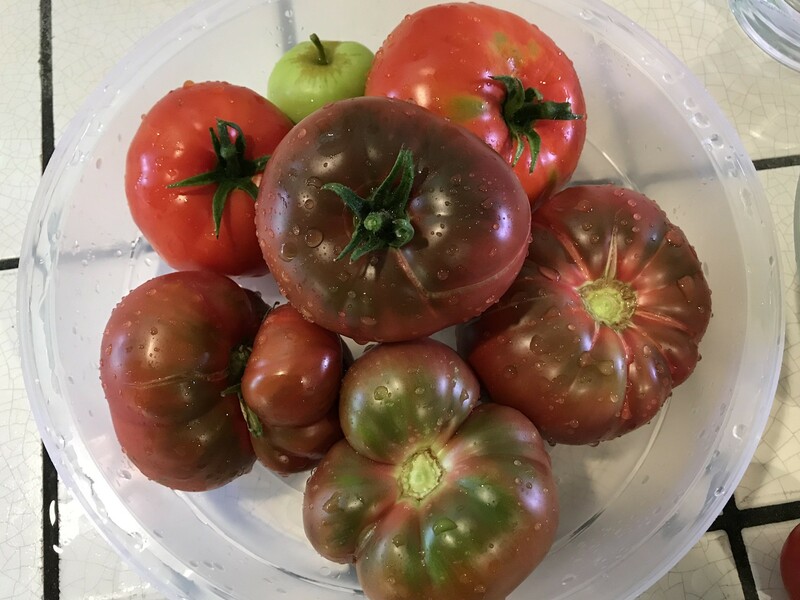 I’ve read about it so many times on tomato forums as being a taste favorite, but had never even heard of it before getting on tomato and EB forums. I guess it’s not something that you’ll find at the regular nursery. WOW yes they DID grow! Nuts, huh?! Can you imagine if I’d been able to get all those other tom plants in at the same time?? Wow, they look great! 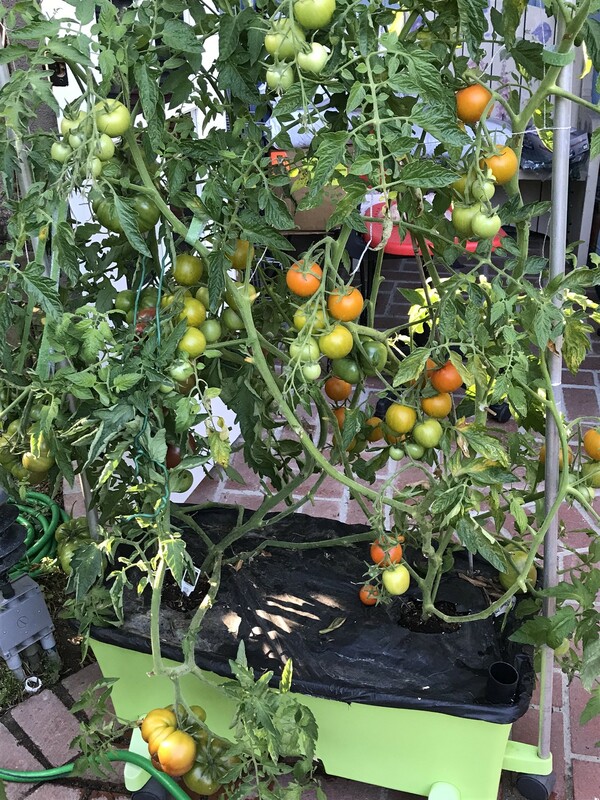 I can't wait to see the tomatoes. Me too! I’ve never grown either of these. I hope they get along well together in the same box. those really grew fast fast fast, Mary. I wish we had some warmth here..some areas are going to see snow tomorrow.We are in for a real cold rain. 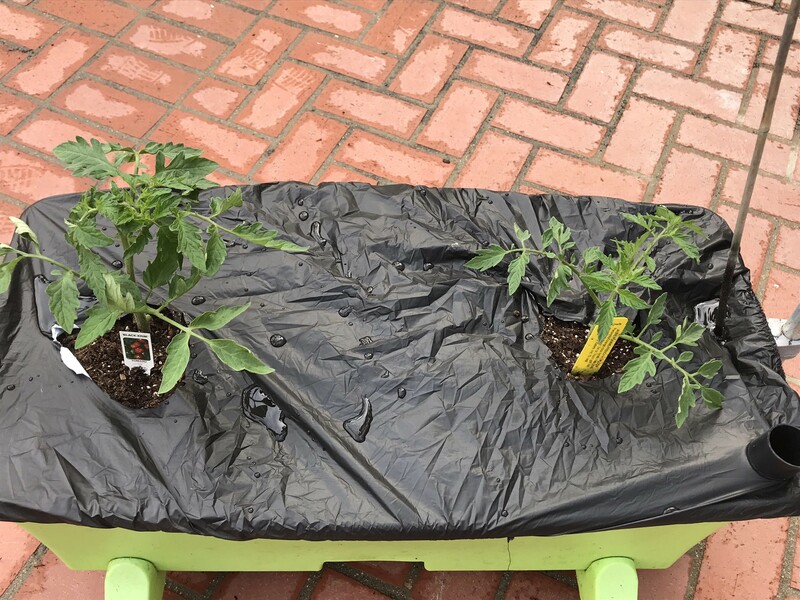 My flowers are ust eager to hit the soil as well as my Whopper Peppers for the EBs. 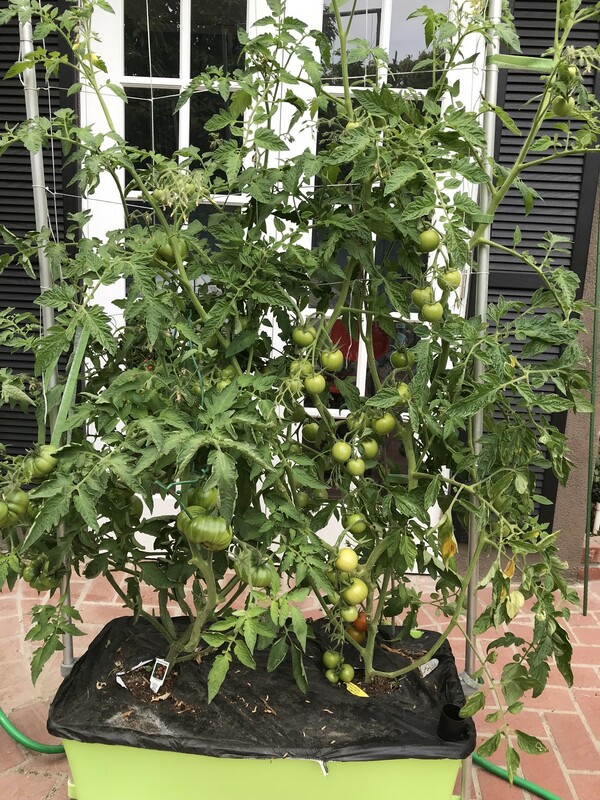 Post major trimming of foliage, and full of tomatoes. And I have my first ripe Jaune Flamme! 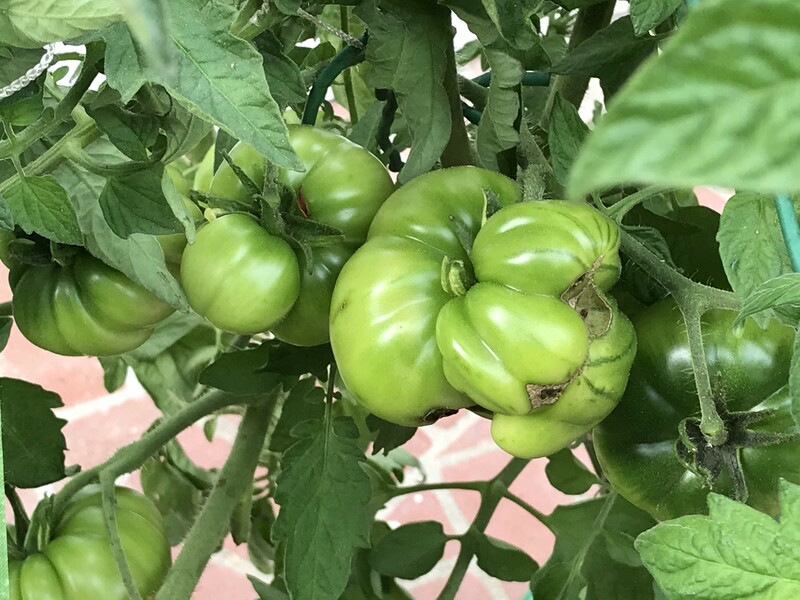 I’ve had the pleasure of trying my first few Jaume Flammes and they’re a mild, sweet and delicious tomato, just as the light orange color would suggest. The low acidity coupled with a more than decent amount of sweetness made me think of Corinne ‘s tomato preference (IIRC). I’m really happy with these, and even happier that it seems to be an early and plentiful producer. My first nearly ripe Krims. From the ad pics I think they’re supposed to get darker, so I’ll wait for the drumroll taste test. These are located on the back of the plant, which is why you can’t see them in the first pic. OMG, they all look great! They're beautiful! Have you tasted them yet?